Marketers now have another well-rounded solution for analyzing data and improving relationships with customers, thanks to IBM Corp.’s release of a digital marketing network. Launching its network on Sept. 19, IBM partnered with more than 100 businesses such as Google Inc., Evidon Inc., and CrowdTwist Inc. It offers real-time analytics for other marketing services like Google Display Network, Google Doubleclick Search, and Badgeville Inc. using dashboards customized to individual marketers for e-commerce. That allows marketers to deal with customers more personally, based on their individual buying behaviours. It also gives them some idea of how their campaigns are performing across paid, earned, and owned channels. The digital marketing network integrates with IBM’s digital marketing optimization program, which is part of IBM’s cloud suite for chief marketing officers. It also provides access to more than 100 solutions with its partners in digital marketing. 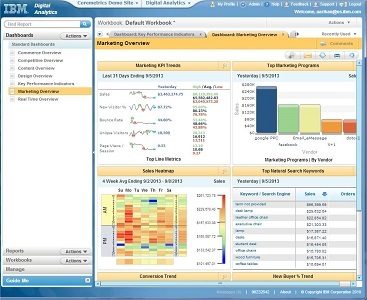 IBM’s dashboard for digital marketing optimization. For example, by using IBM’s digital marketing network, marketers can use Ad Networks to buy targeted ad inventory from many different sources. They also have access to IBM’s Data Management Platforms, which help them collect intelligence about their audience so they can target ads more effectively. Marketers can also make use of the Gamification feature, which boosts customer engagement through giving them rewards, game-style. They can also get access to search marketing, which helps them get promotion with paid and organic search channels. And to manage their privacy, IBM provides companies and consumers with Privacy Management. On the social side, IBM offers marketers Social Engagement and Loyalty, which helps them manage customer engagement with their social media accounts. It also provides them with Social Media Marketing, which gives them the power to do its marketing by using social networks. And its Voice of Customer feature gives marketers a window into what customers want and need, as well as how they feel about their customer service experiences.